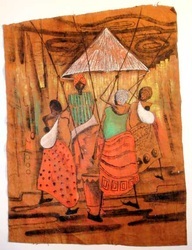 Yusuf Musoke is an established artist whose works are not only exciting but display contrast in both theme and technique. 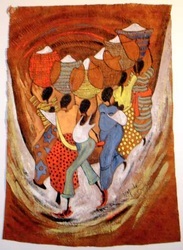 He is a graduate of the Makeree School of Fine Art and the Royal College of Art, London. Musoke is very experienced and gifted and has worked with the Paa-Yaa-Paa Gallery in Nairobi, Kenya. He has had one man shows in Uganda, Tanzania, Kenya, Germany and the United Kingdom. A full time professional artist, Musoke now paints principally on bark cloth which gives his work a matchless sense of freshness and originality. 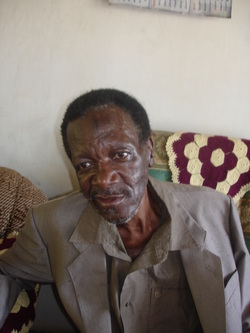 Yusuf passed away June 2009. 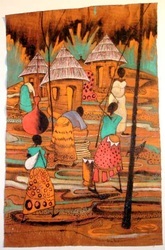 Bark Cloth was made throughout Uganda primarily for domestic purposes from the Mutuba tree. The bark of this tree is very thin and soft and has a beautiful red color, which is achieved by exposure to the sun. The black is made from a mixture of mud, water and the bark of the Kaboga tree. Each tree can yield up to 40 strips and these strips can be beaten into 7 foot length cloths. These cloths are use for clothing, bedding, wall hangings and sacks.